To put the genius of this record into written words is a useless effort. When I listened to the first notes of "Experiment" nearly 30 years ago I became a FAN to the bone within seconds. The songs, sound and atmosphere are hard to describe. Absolutely unique!! I have to disagree about the remaster being good. The compression has mushed everything up too much, and the vinyl version in particular is just painfully bright. The original CD (yep, the CD) remains the definitive version of the album. Incredible involving sound! Recorded, mastered and cut in Germany for Noise Records, this is THE pressing for this record. 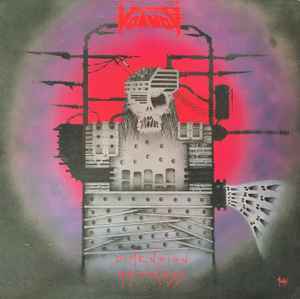 Arguably Voivod's best album. Don't miss it. The tracklist is not correct. The 2nd song is "Batman" while "Tribal Convictions" is missing on this release. Where do you took the release date from??? >On my Korean release it says 1988. Front cover and spine are different to other cassette releases Noise international and DOLBY SYSTEM printed on front cover and spine with SPV-Gmbh 10-4466 appearing on spine. red printed paper cover on black cassette. My US vinyl version is still sealed. I also have the Korean vinyl pressing were "Batman" is the second song instead of "Tribal Convictions". "TC" is not on this release!!! The song "Batman" exists in Europe only as a CD bonus song.